This is another dish we test-drove before our Indian Easter feast. Pakoras are veggie-based fritters common across South Asia and are a popular snack or appetizer in India. Walk into any store in Little India, and you will see them: 2 for $1, although I have no clue who would want to buy cold deep-fried snacks. Lemon Cilantro Pakoras is a recipe from Tess, so we knew it would be scrumptious. However, we wanted to figure out how to make them without deep-frying. Here, we mix finely chopped cauliflower and onions in a lemon-cilantro-cumin studded chickpea flour batter. Akin to a souped up chilla, in ball form, oozing with lemony cilantro goodness. Like naan, these tasty fritters are best fresh, warm straight from the oven. I will admit that we didn’t do a double-blinded randomized control trial for this cooking experiment. We made the batter and cooked them 3 different ways: a) in my aebleskiver pan; b) in a non-stick skillet; and c) baked on a silpat. The hardest part was keeping the pakoras together as we cooked and flipped them, so we also did a batch with extra chickpea flour on the skillet. I took photos of each version, but they kind of looked the same, so I will spare you the repetition. Baked pakoras for the win! First of all, they were definitely the easiest: smush into a ball and bake. Although I flipped them half-way while baking, and then dusted with some oil, they are fairly hand’s off: no need to tend to them over the stovetop, roll them about, fiddle with additional oil, etc. Secondly (although most important), they tasted the best. 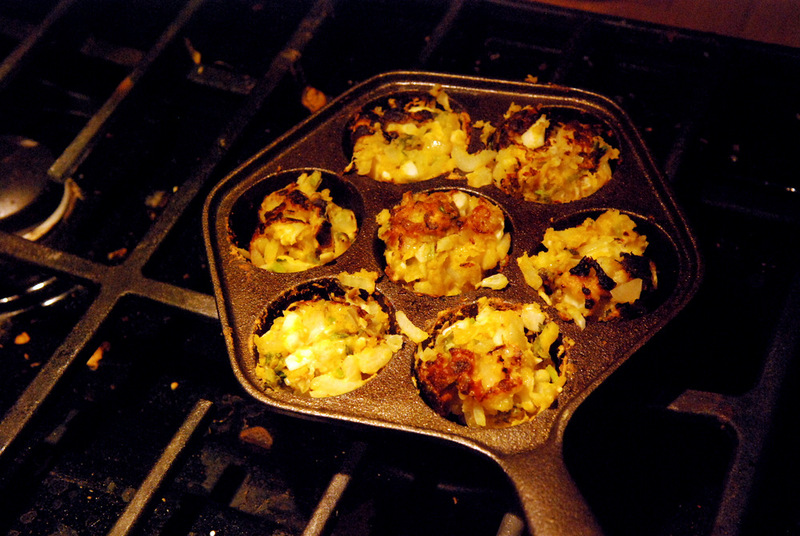 The extra oil needed for the aebleskiver pan didn’t help them not stick and definitely made them taste heavier. The silpat was also easier to clean. Rob and I both preferred the lighter, refreshing taste from the baked pakoras. Out of everything we served at Easter, this was also the unanimous dish loved by all (including my hard-to-please father). I feel like a real gourmand telling you all about pakoras, but the truth is I had no clue was a pakora was until last weekend. Rob, my resident Indian cuisine connoisseur, assured me this tasted authentic and better than what he has eaten at restaurants. He liked these more because they were lighter and healthier. Considering these are basically chopped up veggies slathered in a chickpea flour batter, they seem like a quick, guilt-less snack to me! We enjoyed them with tamarind and mango chutneys, but cilantro chutney would be paired with them more often. This blog is my secret obsession. I’ve spent so much time over there I almost feel like a stalker! Janet is Vegan and while Mr. Foodie and I sometimes struggle to get a day’s worth of veggies, we are trying to eat more meatless meals and more healthily. Her blog is amazing to me and often intimidating but I don’t let that stop me. I read it like I’m studying a book, probably because I can’t pronounce half the stuff she makes and have no idea what the ingredients are so I end up googling them and learning so much about new foods and food combinations. She also provides lots of links to other blogs so the amazing food journey never seems to end. If you want to learn more about healthy recipes this is a good place to start. I am thrilled to know I have been able to keep her inspired to try new ways of incorporating veggies into her meals. Part of why I blog is because I hope to inspire others with easy, healthy cooking and connect with other like-minded people. I also post about my cycling adventures because cycling was a big positive change in my life two years ago. I went from walking 30 minutes a day to/from the subway as my only exercise to building myself up to bike 361 km over 2-days last summer. Even though I now go to the gym regularly and have returned to biking to work, I still don’t consider myself athletic! There is something magical about biking: anyone can do it with a proper bicycle. I don’t consider myself to have any innate athletic skills (I am possibly the most non-athletic person), nor do I have any special skills in the kitchen. My secret to capturing kitchen bliss is to know what I like, push myself in new directions to keep things interesting, maintain a well-stocked pantry and use fresh ingredients whenever possible. I love trying out new recipes but usually tweak them to my tastes. This is being submitted to this week’s Weekend Herb Blogging hosted by Simona, to this week’s Healthy Vegan Fridays, and to Ricki’s Wellness Weekend. 2. In a small bowl, combine the dry ingredients (chickpea flour, rice flour, baking soda, cayenne, turmeric, coriander, cumin powder, cumin seeds and salt). Mix together and set aside. 3. In a large bowl, combine the cauliflower, cilantro, lemon juice and onions, stirring to combine well. 4. Add the dry ingredients to the wet vegetables and stir to combine. 5. With your hands, squish the dough into 1-inch balls and place on a silpat or parchment paper-lined baking sheet. Continue with remainder of dough. 6. Bake pakoras for 20-30 minutes, turning over half-way through. With a pastry brush, coat the exposed side of the balls with the melted oil when flipping the balls. 7. 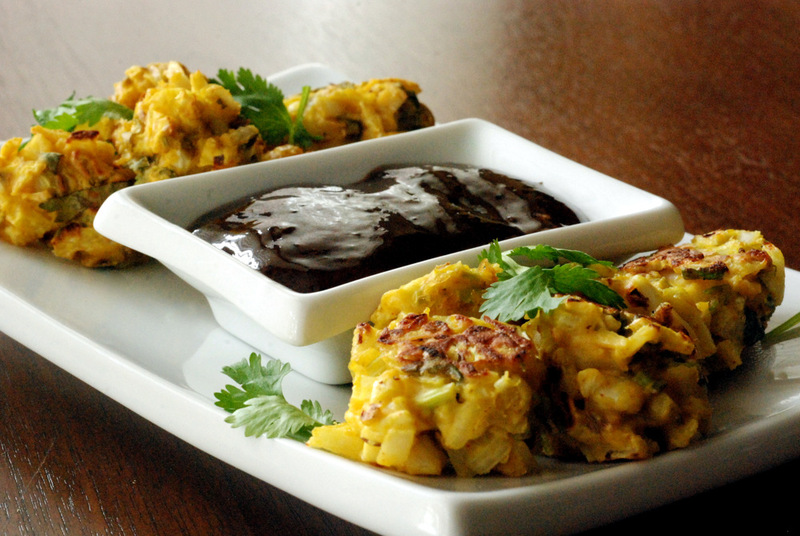 Serve immediately with Indian chutneys (tamarind, mango or cilantro – cilantro chutney is more typical with pakoras). Leftovers can be reheated in the oven at 400F. I love pakoras and am desperate to try the baked version now, do they really stay together? I’m imagining a big pile of mess but maybe that’s just negative projection!! They definitely stay together, but moreso when baked. I found they were crispier if I added the oil part-way through, while flipping them, though. Yay! Now i can make these. Wonderful. I will make them this weekend for a retreat group I am cooking for. I will let you know what the ladies think! These sound so flavourful, and I love how you were able to lighten them up by baking, as the heaviness of the deep-fried ones is usually the only thing I don’t like about pakoras! A deep-fried treat turned healthy? You know that’s totally my kind of thing. Especiallly if it’s Indian-spiced! These sound amazing. I’ve only ever had the pakoras from whole foods but I already KNOW that these would top them. And I TOTALLY think of you as athletic. But I know what you mean. After countless half marathons and two marathons, it’s STILL hard to see myself as an athlete. I’m not sure that I ever really will. Baked pakoras–what a lovely treat. I always eat them by the bagfuls when in India, but rarely make them because of the frying. Love this recipe! I must admit that I also don’t know what a pakora is, but I am glad your experiment with baking them was a success: I always have chickpea flour at home, so I can give these cute fritters a try. Thank you for contributing them to WHB! These were so amazing. Thanks for posting. They were absolutely better than deep-fried pakoras, and the lemon juice was a fanastic touch! What you dint know a pakora!! gasp:) these look great.. i keep thinking of baking them coz i just cant eat more than 1 fried one! time to bake up some pakoras! 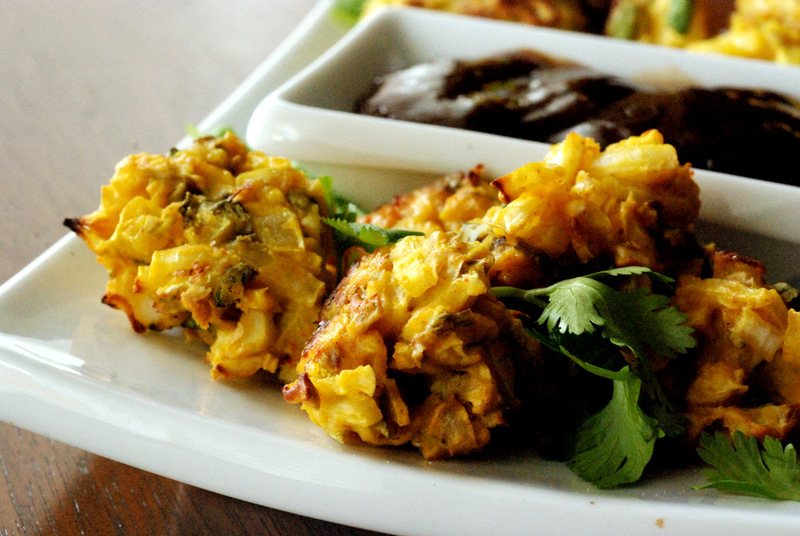 ooo i loooove pakoras and love that you made these into a baked version!! Mmmm, you always seem to post recipes that really appeal to my fussy pregnancy taste buds! These seem so easy, healthy and I love the use of lemon!